Yorgrim Overlook is a small, one-room Nordic ruin on the southern slope of the mountain range directly south of Winterhold. This structure is slightly northeast of Forsaken Cave and south of Mount Anthor. The path leading to it starts just to the right of Forsaken Cave heading northeast, near the top there are stairs up to it from in front, to the south with statues flanking it. 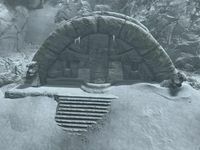 The entrance is similar to several Nordic Barrows around Skyrim, however where the entrance doors are normally, there is a locked gate of expert level blocking access to an unlocked chest. There are two upright sarcophagi within the ruin with one in each corner. As you approach one or both of the sarcophagi will burst open and skeletons will emerge. There are stone tables beside these sarcophagi, the one to the west has two burial urns on top and the one to the east is broken and has three steel ingots on top. One orichalcum ore vein is located to the east-northeast of the overlook. This page was last modified on 22 August 2016, at 05:19.